Hurix Systems, a leading learning technology solution provider was recently awarded, “The Leading Training Outsourcing Company” by Training Industry Inc.’s Outsourcing Companies Watch List for 2016. Hurix’s win was announced on April 7, 2016. The company has secured a position in this training outsourcing companies watch list for the second consecutive year. This list is published annually by Training Industry Inc. to continually monitor the training marketplace for the best providers of training services and technologies worldwide. Hurix surpassed all parameters of selection criteria with its extensive work and innovative service offerings across learning & training development industry. With industry presence of more than 15 years and a strong team of 600+ eLearning specialists on board, Hurix has helped 330+clients worldwide, developing 800,000 hours of engaging bespoke content for corporates, institutions and publishers. The commitment of quality at Hurix Systems has earned the goodwill of customers from diverse industries for their training needs, creative course designs, and delivery. “Our winning spree continues and we are delighted! This is a validation of our technology and capabilities for the training industry. Our focus is to provide world-class digital content solutions, keeping in mind the latest training trends made available on any mobile device,” said Subrat Mohanty, CEO, Hurix Systems. “The 2016 Training Outsourcing Watch List represent a solid group of organizations that are prepared to support your company’s training endeavors,” said Doug Harward, CEO, Training Industry, Inc. “The Watch List companies demonstrate the ability to develop and deliver focused learning solutions and programs,” he added. Hurix Systems is the leading digital content solutions provider to global educational publishers, institutions and corporate. Hurix Services provides effective, compelling, and engaging digital content that is platform agnostic. Hurix has won multiple awards (Brandon Hall 2013, 2014 & 2015) for its platforms, KITABOO and Dictera in the field of learning technologies, Mobile & Content Authoring. 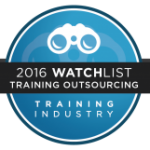 Hurix has been named among the leading training outsourcing companies watch list in 2015 by the Training Industry Inc. Recently, the company has won 2015 Red Herring Top 100 Asia Award and is named among the Top 20 Authoring Tools Companies. Aditya Chakravarthi, aditya.c@hurix.com ,+91-22-61914888. Hurix Systems Pvt. Ltd.